It is our pleasure to welcome you to Cascade Culinary Institute® (CCI) – the Pacific Northwest’s finest culinary arts education provider. The CCI faculty and staff are committed to your academic success. CCI offers an array of degrees and certificates, which are accredited by the American Culinary Federation Foundation’s Accrediting Commission. Student learning at CCI is grounded in a competency-based curriculum that combines lecture and demonstration with applied learning activities and instructional assessment. Our talented CCI faculty deliver an integrated approach to sustainability from both an operational and instructional perspective, while our world-class facility, The Junger’s Culinary Center, holds an Earth Advantage Gold Standard rating. Our faculty and staff are passionate about the field of culinary arts, and possess a strong experiential background as culinary innovators, restaurateurs, and Executive Chefs from a diverse industry segments. The Jungers Culinary Center is a 15,205 sq.ft dedicated educational facility and consists of three instructional kitchens, a 50-seat demonstration theater, and a dining room that houses Elevation, a student-run and operated restaurant. Bend, Oregon is a beautiful recreational area with a diversity of outdoor activities and a density of restaurants and resorts that can serve as internship sites or post-graduation employers. Residents of CA, ID, NV and WA all receive tuition at the in-state (out of district) rate. Be sure to compare the curricular offerings, cost, and student-centered culture with other institutions and you will discover that Cascade Culinary Institute is the place for you. 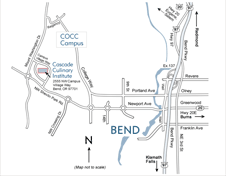 We would like to personally invite you to visit Cascade Culinary Institute and our facility here at the Central Oregon Community College campus. Check us out on Facebook and feel free to contact us so you can take the next step in pursuing your culinary education!